The Strain is a trilogy written by Guillermo del Toro and Chuck Hogan. It tells the story of the end of the world as we know it through the spread of a vampire virus. Throughout the novels we follow the CDC medical experts Ephraim Goodweather and Nora Martinez, vampire hunter Abraham Setrakian, professional exterminator Vasiliy Fet, and gang member Augustin “Gus” Elizalde in their fight against The Master, the vampire mastermind behind the outbreak. The first part of the trilogy, The Strain, comes across as a well-researched novel, where detailed descriptions add extra layers to the narrative. However, as I discussed in a previous post on The Boomerang, when taking a closer look at the information provided by the authors, some of the details are either incorrect or presented in a slanted manner. In the second part of the trilogy, The Fall, we follow the continued adventures of our group of survivors as they struggle to fight back against the vampires who have taken over the world. 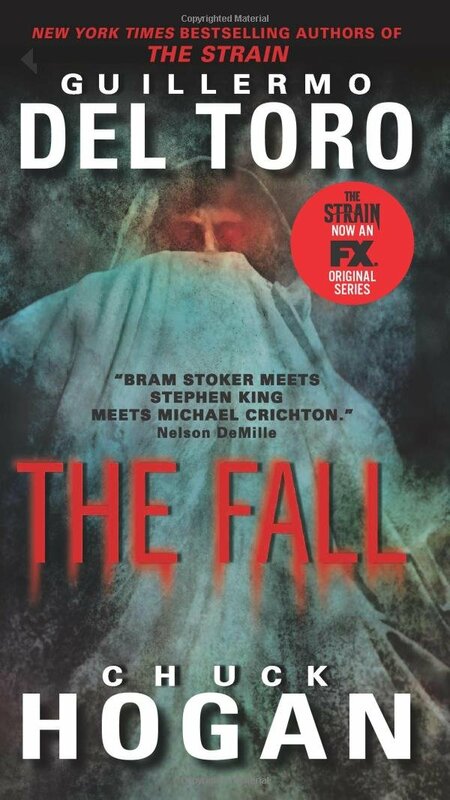 As in the case of The Strain, The Fall contains passages based on seemingly thoroughly performed research. However, just as in the case of the trilogy’s part one, some of the statements made in part two crumble when picked apart. Let’s take a closer look at The Fall. The Fall begins with a diary entry written by Ephraim Goodweather. The entry is a brief recapitulation of the events that passed between the end of The Strain and the beginning of The Fall. Ephraim ends his diary entry on a philosophical note. There are several problems with this statement. Yes, it is true that the dinosaurs have left few traces of themselves, some of them found in amber. However, the dinosaur remains found in amber are not bones, but microscopic traces of feathers. So far, dinosaur bones have exclusively been found as fossils. Regarding stomach contents and waste, these too have only been found as fossils, not preserved in amber. Moreover, admittedly few in number, there are more dinosaur bones that have been discovered than stomach contents and waste. The McGuffin of the story in The Fall is an ancient book called Occido Lumen. This book contains the secrets to the destruction of The Master. The book is first introduced when Abraham Setrakian reads its entry in the Sotheby’s auction catalog. What this entry tells us is that the Occido Lumen is an illustrated manuscript from 1667. An illustrated manuscript is a book with pages made from parchment and bound by wooden boards. Illuminated manuscripts were mostly produced during the Middle Ages. In other words, an illuminated manuscript from 1667 is a very late example of this kind of book. 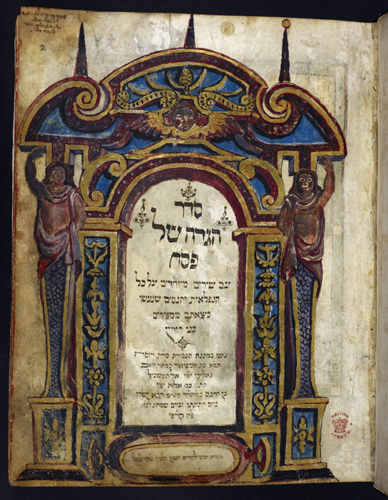 Haggadah title page (Additional 27210 f. 2, British British Library, Catalogue of Illuminated Manuscripts). So far the description of Occido Lumen is straightforward and in line with what could be referred to as alternate history. The big problem occurs on pages 248 and 249 of The Fall. From this detailed and vivid description we understand that Occido Lumen is an impressive illuminated manuscript, handwritten on parchment. 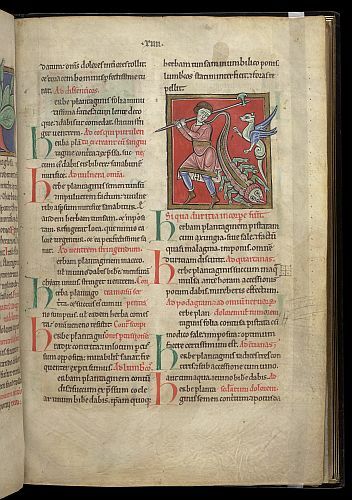 Left image: Man with Dragon (Sloane 1975, f. 13, British Library, Catalogue of Illuminated Manuscripts). 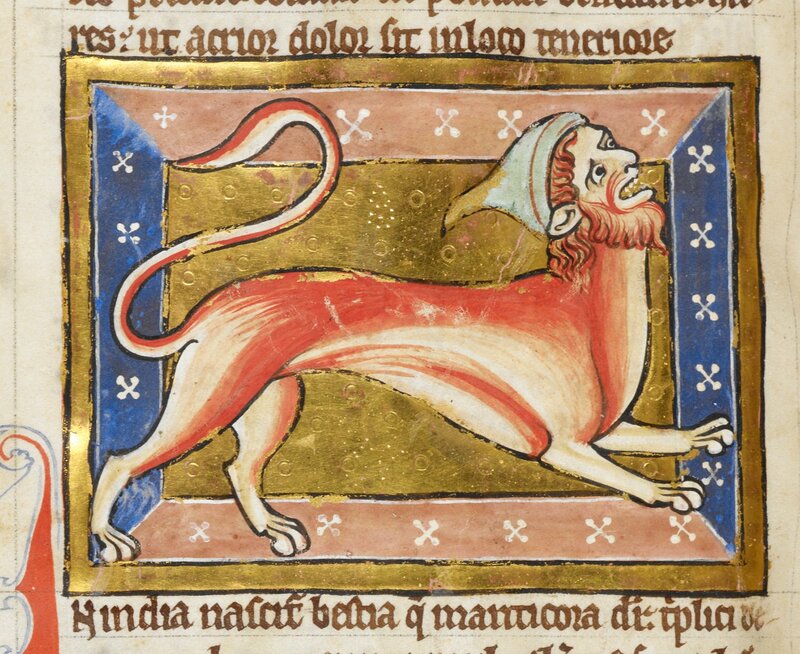 Right image: Manticore (Royal 12 C XIXm f. 29v, British Library, Catalogue of Illuminated Manuscripts). On page 249, Setrakian and Fet leave Sotheby’s. The vampire hunter proceeds to explain to the exterminator what he found when examining the book. Above it was stated that Occido Lumen is an illuminated manuscript handwritten on parchment. Here, Setrakian is talking about the book consisting of printed paper pages. What is going on? I believe that the confusion stems from the fact that the word “parchment” can mean two things. The most common meaning of the word is prepared animal hides used for writing before the introduction of printing. But there is a second meaning of the word, namely a crude type of paper. The mistake that seems to have been made here is that the word “parchment” is used referring to a type of paper while the Occido Lumen itself is called an illuminated manuscript. An illuminated manuscript is a medieval literary and visual art form that is produced exclusively on parchment made from animal hides. Still, this doesn’t explain why the authors seemingly can’t decide whether the book is handwritten or printed. In addition to the issues raised here, The Fall contains several instances of inconsistencies, repetitions, and cliched dialogue. When I read the book, I kept asking myself if the editor and fact-checker went for a liquid lunch and then forgot to finish the job. Sid Perkins, “Dinofuzz found in Canadian Amber,” Science. Brian Switek, “Stomach Contents Preserve Sinocalliopteryx Snacks,” Smithsonian Magazine. Christina Reed, “A Dinosaur’s Wasted Legacy,” Geotimes. Although novels are fiction, research is an important part in the process of making the story of the novel both probable and plausible. 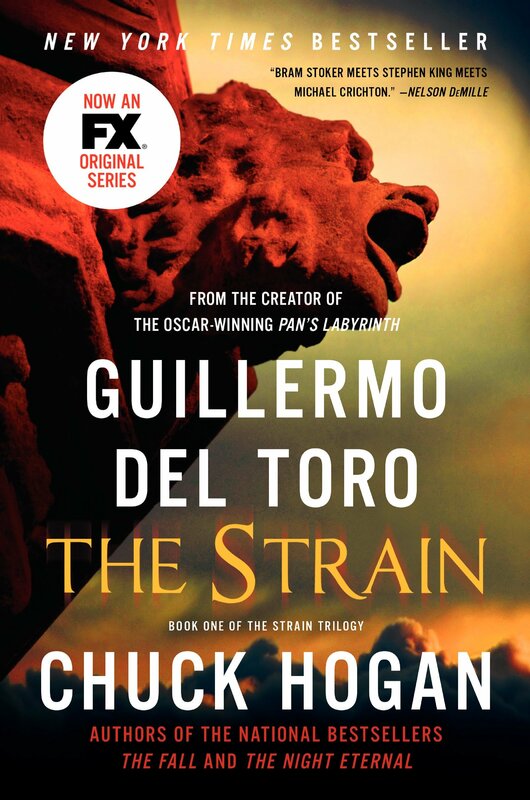 The Strain by Guillermo del Toro and Chuck Hogan is an example of how authors can simultaneously succeed and fail when researching a novel. The Strain is the first part of a trilogy about how a vampire virus spreads among humans in North America and brings an end to the world as we know it. The main characters are Ephraim Goodweather, MD and CDC specialist, his colleague Nora Martinez and vampire hunter Abraham Setrakian. The novel begins with a Boeing 777, which only minutes after landing at JFK Airport in New York becomes stranded on the taxiway, all its systems are shut down and everyone aboard are seemingly dead. In the cargo hold, a mysterious coffin filled with soil is discovered. In summation, del Toro and Hogan seem to have written a well-researched novel in which to place their vampire tale. Let’s take a look at three instances where in-depth research seems to have been done, but in fact either has been done poorly or not at all. If the authors had been consistent in their description of procedures, a detailed account of Bolivar’s “nightly ministrations” would have been provided. I am sure a cosmetologist would have loved to have answered any of their questions. Is this true that we all have been calling a fascinating astronomical phenomenon by the wrong name? The answer to that question is both yes and no. Britannica.com defines an eclipse as a “complete or partial obscuring of a celestial body by another. An eclipse occurs when three celestial objects become aligned.” The encyclopedic entry goes on to explain that there are many different types of eclipses, of which occultation is one. Therefore, “solar eclipse” is not a misnomer and “occultation” is not the only proper term. An occultation is a kind of eclipse. However, when writing a horror story it makes for a good set-up if a word containing the root “occult” can be used as a foreshadowing of what is to come. 3) What did the Romans ever do for the Poles? Absolutely nothing. Abraham Setrakian is a Holocaust survivor who has dedicated his life to hunting the vampire that arrives in New York on the ill-fated Boeing 777. He first encountered the creature at Treblinka when it came to feed off weakened concentrations camp prisoners. Determined to stop the creature, Setrakian starts asking around among the other prisoners. During the Treblinka uprising in 1943, Setrakian is one of the prisoners who manages to escape and avoid capture. He immediately sets out to locate the creature’s lair and succeeds. There are several issues that need to be discussed concerning the creature’s lair. One problem is that del Toro and Hogan can’t seem to decide whether the lair is a “crypt” or a “catacomb.” A crypt is a “vault or subterranean chamber, usually under a church floor.” There is no indication in the text that a church had stood at the site of the lair. A catacomb, on the other hand, is an underground cemetery and the term is used exclusively for such cemeteries in and around the city of Rome. But the terms used to described the lair are not the main problem. The main problem is the fact that the lair is described as Roman. Why is this a problem? It is a problem because the Roman Empire never included what is today Poland and the location of the Treblinka concentration camp. 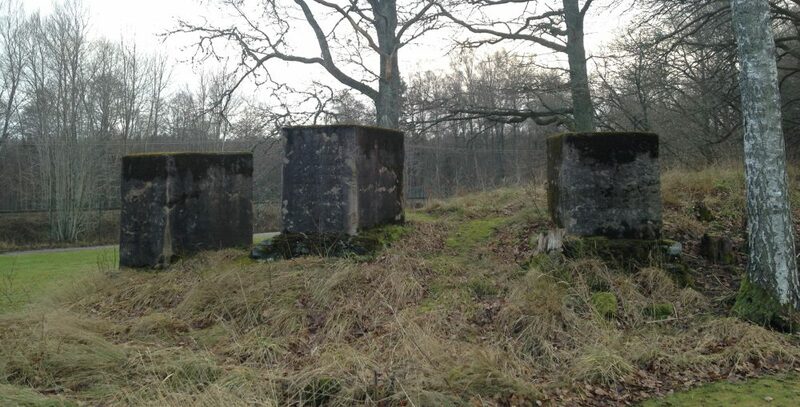 The sheer fact that Roman ruins are found in the Polish forest is historically inaccurate. At its height the Roman Empire reached as far south as North Africa, as far east as present-day Turkey, Syria, Jordan and Israel, as far west as Spain and as far north as England. In the northeast, the Roman Empire reached to the rivers of the Rhine and the Danube. The Rhine runs through cities such as Strasbourg on the German-French border and Basel in northern Switzerland. The Danube runs through Vienna in Austria, Budapest in Hungary and Belgrade in Serbia. Map of the Roman Empire from 510 B.C.E to the fall of Constantinople in 1453. Why del Toro and Hogan decided to make the lair of the creature explicitly Roman, I can’t understand. I am currently reading part two of the trilogy and so far there has been no mentioning of why the lair is of Roman origin, indicating that this particular piece of information is of no consequence to the development of the story. Moreover, the result of this decision is that I, the reader, begin to question everything else they throughout the novel have claimed to be established facts. On the whole, The Strain is an entertaining read. It’s a fast-paced attention-grabbing adventure that brings back horror to vampire lore, written by two authors who take a keen interest in technology and medical science. However, if you want to come across as a credible storyteller, you can’t research only the things that interest you and ignore those that don’t. Thank you to Ida Östenberg, scholar and researcher of Classical Studies, Department of Historical Studies, University of Gothenburg. The .gif map of the Roman Empire has been downloaded from Wikimedia Commons.